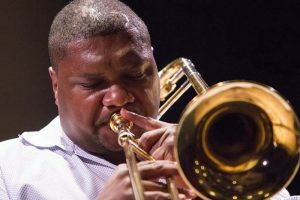 Wycliffe Gordon has an impressive career touring the world performing hard-swinging, straight-ahead Jazz receiving great acclaim from audiences and critics alike. His unmatched modern mastery of the plunger mute and his exceptional technique and signature sound have solidified Gordon a place in musical history known as one of the top trombonists of his generation, routinely named “Best in Trombone” by the Downbeat Critics Poll and “Trombonist of the Year” by the Jazz Journalists Association. mute and his exceptional technique and signature sound have solidified a place in musical history as one of the top trombonists of his generation. The critics agree: Wycliffe was named “Best in Trombone” by the Downbeat Critics Poll three years running (2014, 2013 & 2012) and the Jazz Journalists Association named him “Trombonist of the Year” in 2013, as well as previous years 2001, 2002, 2006, 2007, 2008, 2011 and 2012. He is a past recipient of the ASCAP Foundation Vanguard Award, among many others. In addition to an extremely successful solo career, Gordon tours regularly leading the Wycliffe Gordon Quartet, headlining at legendary jazz venues and performing arts centers throughout the world. Gordon is a former veteran member of the Wynton Marsalis Septet, the Lincoln Center Jazz Orchestra and has been a featured guest artist on Billy Taylor’s Jazz at the Kennedy Centerseries. Gordon’s extensive performance experience includes work with many of the most renowned jazz performers of the past and present. His Jazz a la Carteshow, which debuted at the Apollo Theater, was named one of the “top five best moments in jazz” for the year 2011 by The Wall Street Journal. Gordon’s recordings are a model of consistency and inspiration, and his musical expertise has been captured on numerous recordings, including sixteen solo CDs and seven co-leader CDs. His most recent releases, Hello Pops, A Tribute to Louis Armstrongand Dreams of New Orleans, which pay homage to Wycliffe’s musical hero, received rave reviews. In 2013 Criss Cross released The Intimate Ellington: Ballads and Blues, which showcases Wycliffe’s vast knowledge of Ellington and Strayhorn techniques. Wycliffe Gordon is also a gifted composer and arranger who is commissioned frequently by jazz groups and organizations, and has an extensive catalog of original compositions that span the various genres of jazz and chamber music. Musicians and ensembles perform his music throughout the world, and his arrangement of the theme song to NPR’s All Things Consideredis heard daily across the globe. Gordon is one of America’s most persuasive and committed music educators, and served as Artist-in-Residence at Georgia Regents University in Augusta, GA starting in the Fall of 2014. As part of this three-year appointment, Wycliffe is developing a jazz studies program as well as teaching courses and working with the music majors. In addition, he serves on the faculty of the Jazz Arts Program at Manhattan School of Music and continues as Music Director for the LALPC (Louis Armstrong Legacy Project) in Chicago. His songbook This Rhythm On My Mindwith accompanying CD was released in 2012 after the success of Sing It First, Wycliffe’s own unique approach to playing the instrument. He continues to publish original music, and his lead sheets, trombone music and big band charts are all available on his website. His work with young musicians and audiences from elementary schools to universities all over the world is extensive, and includes master classes, clinics, workshops, children’s concerts and lectures — powerful evidence of his unique ability to relate musically to people of all ages. PJS Jazz Society is thrilled to welcome Wycliffe Gordon back to our stage for the finale concert of our 2018-2019 season on April 14, 2019! PJS Jazz Society presents the best in jazz every Second Sunday at First Presbyterian Church, September through April. Young Musicians opening set from 5:15-6:00 pm. Two Headliner sets from 6:30-9:00 pm. Concerts are held in a cabaret setting. Additional parking available at the Holmes School (next to the Church on Columbus Avenue).